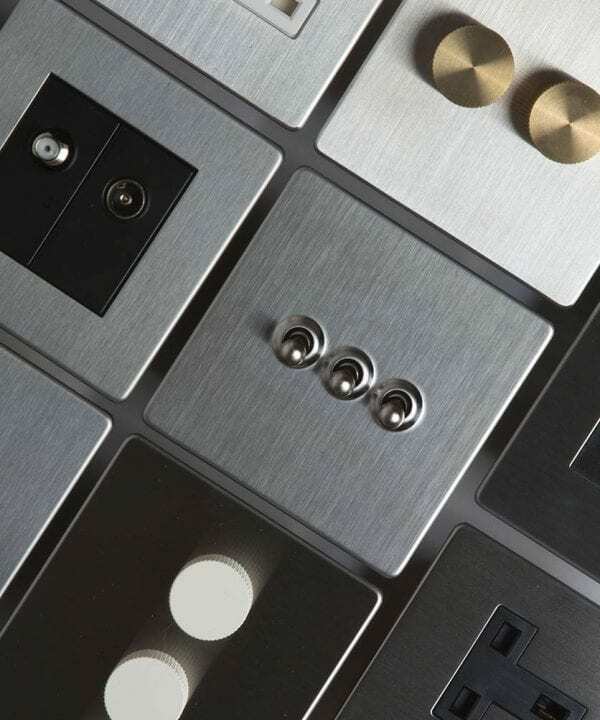 Our collection of high-quality light switches and sockets is available in a variety of unique finishes across the entire range – they’re all designed to be both a pleasure to use and look at. We’ve also included some kitchen specific switches and sockets so you can have a stunning combined cooker switch and socket that perfectly matches your dimmer. Our FAQs page has lots of technical information about the specifications and uses of the more complex switches. It’s a shame to opt for the standard white plastic versions of switches and sockets when there are much better-looking ranges available. 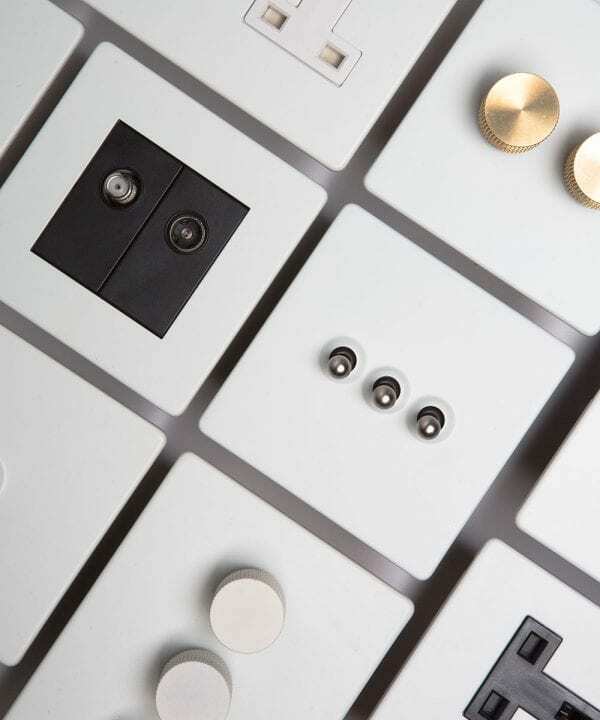 Changing light switches and sockets is a great way to add designer flair to any room. You won’t have to strategically position your furniture to hide the plug sockets. 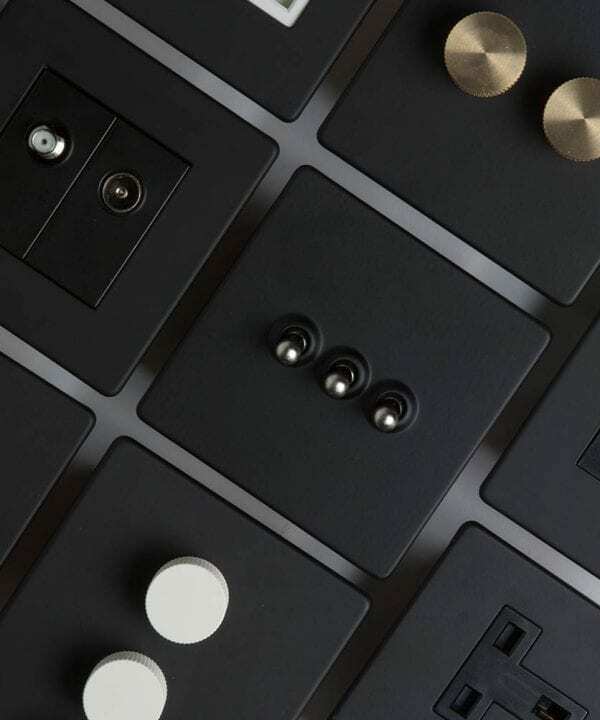 Our matt black metal sockets and light switches are a classic – choose the colour of your dimmer knobs or toggle switches to add a little flourish all of your own. For something a bit different, choose the sultry smoked gold finish. 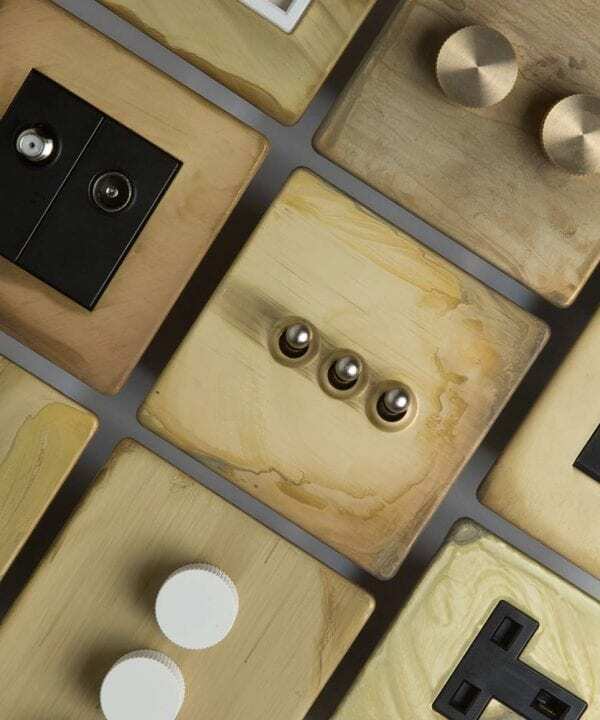 All of our light switches, dimmers, toggle switches and sockets come in a choice of six finishes; matt black, matt white, silver, gold, smoked gold and tarnished copper. 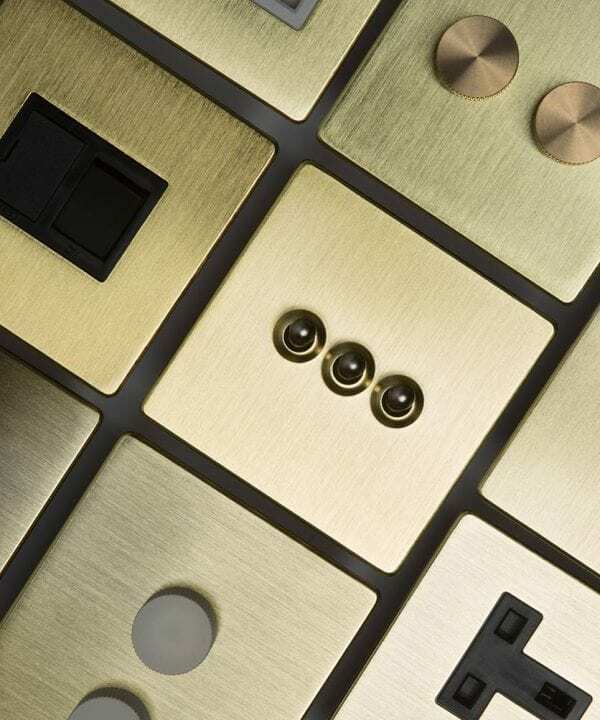 If you want to add a touch of luxe to your spaces, opt for silver (brushed steel) or gold (brushed brass). These satin-look finishes are a far cry from those outdated brassy varieties and look amazing in any interior style. For the ultimate statement, tarnished copper and smoked gold are the ones. You won’t find anything like these elsewhere. Each plate is hand finished to have an authentically distressed finished. With swirling tones drifting across the matt brass and copper plates, you won’t find any two switches the same. These are not for neat freaks! 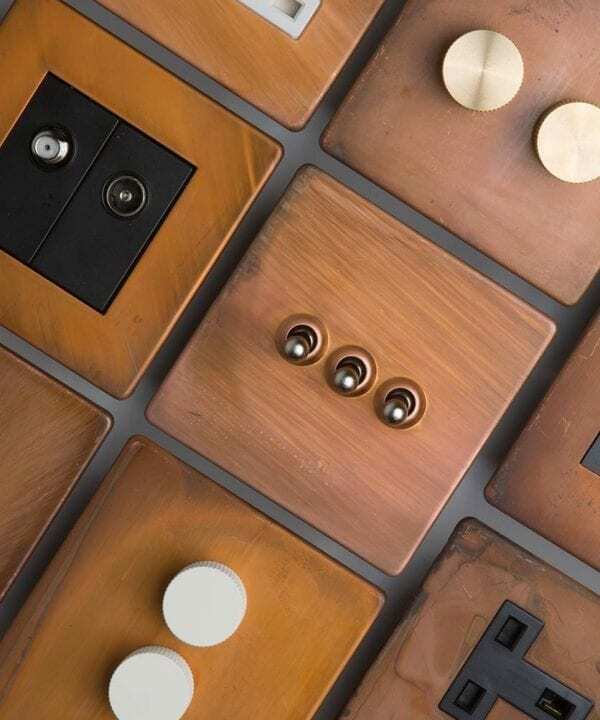 Once you’ve chosen your back-plate finish then you get to choose the insert colour for sockets or knob/toggle colour on dimmers and toggle switches. Plug sockets come with either black or white inserts whereas switches can be silver, gold, white or black. You can really go to town and create something very unique or, play it safe with tone on tone. The choice is yours. One of the most annoying things about upgrading switches and sockets is the lack of availability across the range. We continually add to our range to make sure you can have everything matching. Even some of the more unusual socket specifications are covered… Unswitched sockets, fused spur switches, double plug sockets with USB charging points and even black fascia plates. We’ve got it all so you can finish off any room without compromising. All are designed with concealed fittings, our switches and sockets have no visible screws to ruin their streamlined look. They also fit flush to the wall for a sleek finish.